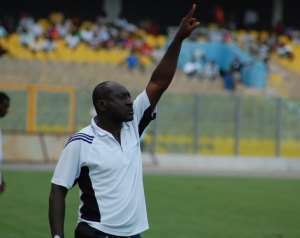 Aduana Stars gaffer, Yusif Abubakar has expressed happiness about his side progression of the CAF Champions League after defeating Libyan side, Al Tahaddy 2:0 at Dormaa on Wednesday. The 2016/17 Ghana Premier League champions went into Wednesday's clash against Libyan outfit needing to overturn a 1-0 deficit after losing in Egypt two weeks ago. Elvis Opoku and Derick Sasraku find the back of the net in the second half to ensure they progress to the second round of the competition on 2-1 aggregate scoreline. "I can't actually describe the feeling after the game. In fact, I'm the happiest man around now because our hard work paid off," Abubakar told Goal. "The first-half was a bit uninspiring but the players adhered to my instructions after the break and we had two important goals to make it to the next stage. I'm happy and will thank the supporters because they were massive," he added. The Ghanaian champions will now meet Algerian side ES Setif in the last qualifying round with the winner making it to the group stage and, Abubakar is upbeat about their chances of qualifying to the group stages for the first time in their history. "This is the first time we've progressed to the next stage in this tournament so obviously, we can make another progress. We are with high hopes that we will make it to the group stages so we won't over celebrate this victory," he said. Aduana will welcome Setif to the Nana Agyemang Badu II Park in the first leg on March 8 before enplaning to Algeria for the return encounter a fortnight later.